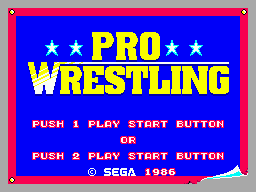 Pro Wrestling, known as Gokuaku Doumei Dump Matsumoto (極悪同盟 ダンプ松本) in Japan, is a sports/wrestling game developed and published by Sega for the Sega Master System. It is an adaptation of the Sega System 16 arcade game Body Slam, released the same year. In Japan, the game features an all-female roster and is endorsed by Japanese professional wrestler Dump Matsumoto. She was removed in the Western releases in favour of a fictious all-male cast. Main article: Pro Wrestling/Magazine articles.